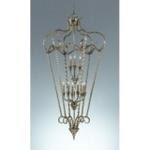 Anytime I come across something that is large in scale and could be used for either inside decor or garden decor, I usually purchase it. 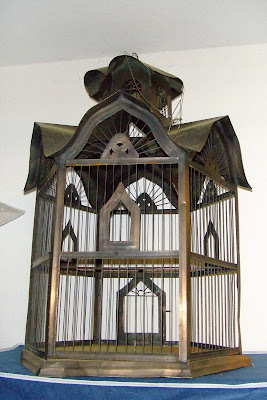 I recently came across a bird house that I loved. 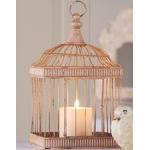 I bought it knowing that I could use it somewhere, somehow in my decorating. Best thing is that I paid $4.00 for it! 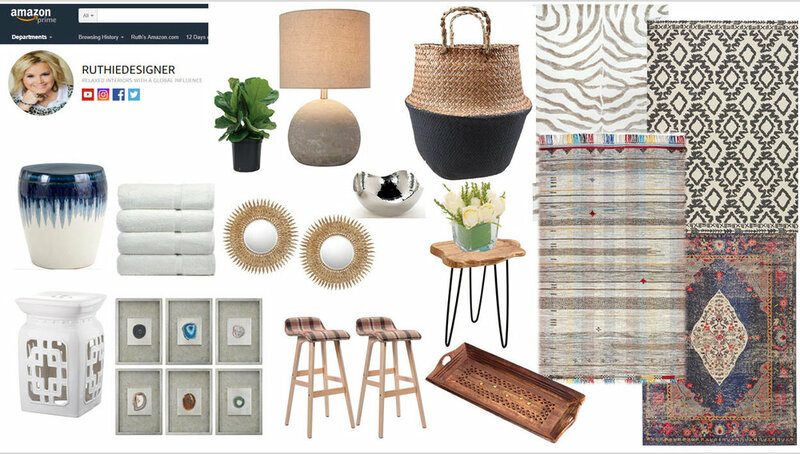 Here are some ideas and inspirations that went through my head. 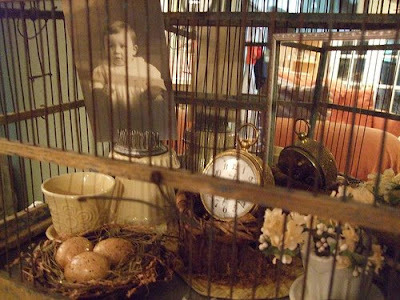 Love the idea of putting memorabilia in the bird cage. 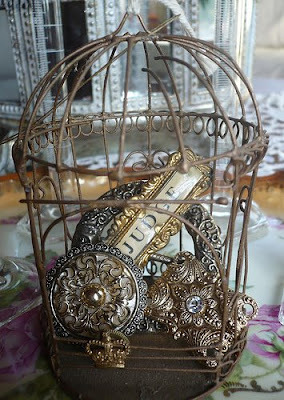 Eclectic items that have a story. 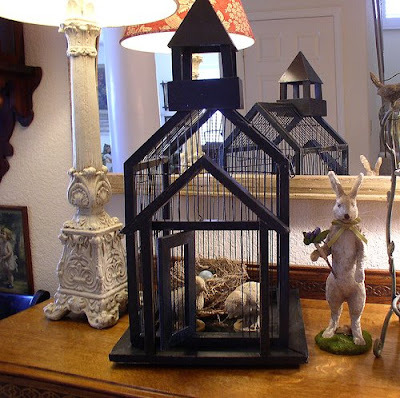 Great idea for Easter Decorating. 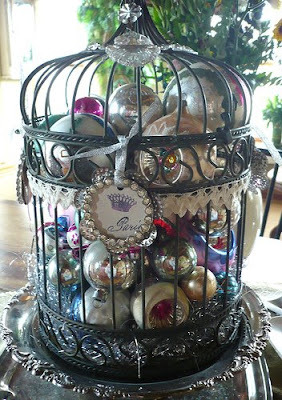 Love this idea; these are vintage Christmas ornaments. 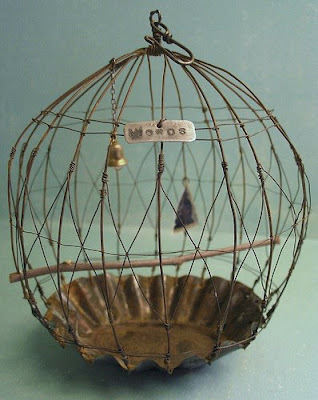 Well, Ive decided I'd like my birdcage to be made into a light fixture for under my cabana on my patio. 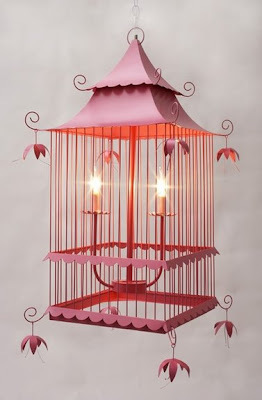 I was inspired by these light fixtures and thought.....why can't my birdcage be a light fixture. My birthday is this weekend and my husband asked what I wanted. I know that his love language is the gift of time. He has made so many wonderful things for me. Of course, he needs the idea and concept first. I've given my ideas to him and now I can get excited about what he's going to come up with. I've asked him to add subtle lighting. I don't like it when lights glare in your face. 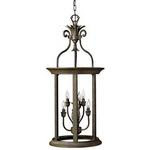 Luckily he's very handy and creative so I trust he will come up with the perfect fixture. Lucky me! I can't wait to see what he comes up with! The best part is that he is going to involve the girls and that makes the gift even better! Could this be what he does? Easy way out?? NOT! Maybe this? Hmmmmm?? I'll post pictures of what he comes up with!